SRV strat or 60th anniversary commerative strat? Discussion in 'Guitars in General' started by al89, Feb 25, 2012. 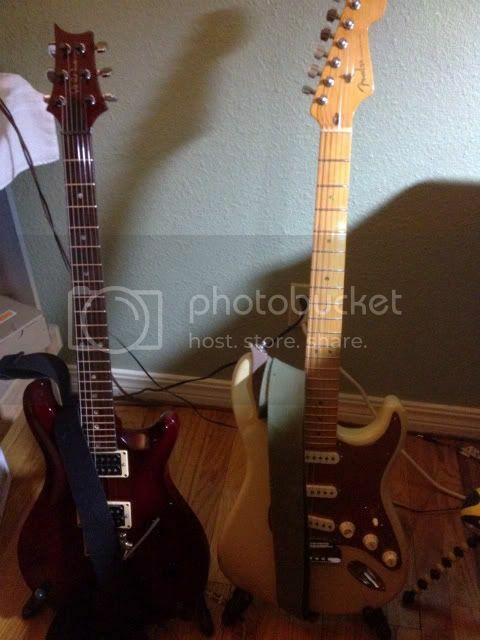 Hey guys, I am deciding between these two sweet axe. Wondering how does each guitar will sound and what kind of music or different genres it can cover. So what are your picks? No replies? Would certainly love some opinions and advises! I play Praise and worship with a 1999 SRV. I love it. It's my number one guitar. Did ya see what I did there. Cant comment on the 60th. never played one. The SRV is a great strat. pickups are hot. They are both great Strats. 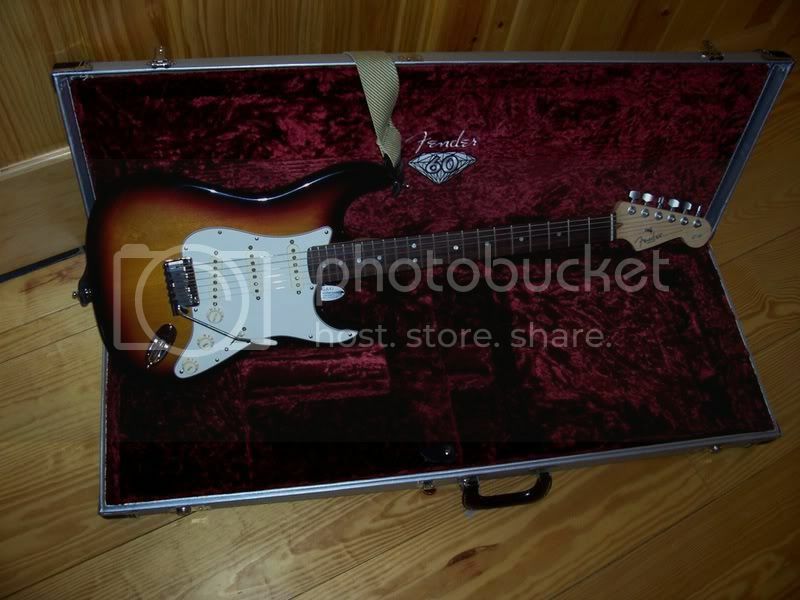 I have a 60th, and it is a great Strat, nice sunburst 7.5lb, 2-piece body, 59-62 pickups, and I use it for pretty much any type of music. I can get great SRV/Mayer/Hendrix, blues, classic rock, country,P&W, etc, etc. It is just a great all around Strat. I recommend you give them both a try as they each have a different "feel" to them. The 60th is more modern, 2 post bridge with a "C" shape profile, neck 9 1/2" radius fretboard, and the SRV has the left hand 6 screw bridge with an eliptical profile neck, 12" radius fretboard. Again both are generally excellent Strats. On an individual basis guitars can vary, some just sing, and some are just meh. So check each one out if you can. Ah ic, I really wanted an SRV but seems that my potential seller won't budge on his sale price. However since the 60th is able to get srv tones out of it guess I will be settling on the 60th strat. I am in my church praise and worship team too so hopefully i will be use it adequately! i like stevie's original strat of course, but there's just something about wearing someones name on the headstock of my gutiar that bothers me, plus there's so many stevie wannabe's out there! The Strat came out in May 1954. A bit early for calling it 60. Does the pau ferro board on the SRV sound different than rosewood? I always wondered why they used that when the whole purpose of a sig is to give you a guitar as close as possible to the namesake. Or did stevie at some point have the board on his replaced with pau ferro? I'm very biased, but mine is the best sounding and feeling of all the strats I've owned. They initially got spec'd to use Brazilian Rosewood, which some of the first year (1992) models had. However due to issues with the Rosewood at the time, they switched to Pao Ferro. I seem to remember reading that it was chosen for its similarities to rosewood as well as its ability to stand up to multiple refrets. I only have my Brz RW model, and have never played a Pao Ferro model plugged in, so I couldn't tell you if it sounds different. Sorry to have to tell you, but yours is not a 60th Anniversary model. Most Strats of that year have the small round emblem on the back of the headstock, that does not make them a 60th Anniversary American Standard Edition. The American Standard 60th Anniversary Edition has a diamond inlayed on the front of the headstock, Alder body, 57/62 RWP pickups, Delta tone, Rosewood fretboard with rolled edges and pearl marker inlays, has engraved diamond neckplate, only comes in three color sunburst, and has a special silver commemorative 60th Anniversary case with maroon poodle lining and diamond embroidered in the lid.